Based in Irvine, Calif., Robin Hartfiel is a contributing writer for MPN and industry consultant. As editor-at-large, he reports on the powersports market as well as represents MPN in the marketplace at industry events and functions and assists with MPN's industry advisory board. After 25 years in the lineup, Harley shocked their dealers with the news that the Dyna was done. Ditto for the V-Rod after its 16-year production cycle. This was just some of the news that was presented to Harley-Davidson dealers at their annual dealer meeting held in the Los Angeles Convention Center August 21-25, 2017. The new mono-shock frame replaces the Dyna’s long-standing setup, which hasn’t made the purists too happy, but will hopefully make sense to Wall Street… and the next generation of customers. “We focused on taking the total rider experience to a higher level, where authenticity, heritage and soul meet the modern edge of technology for a ride that must be felt to believe,” added James. 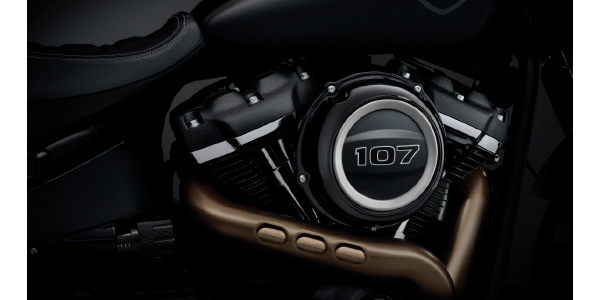 The eight new bikes feature a stiffer and significantly lighter frame mated to new dual-counterbalanced Milwaukee-Eight 107 and 114 engines. 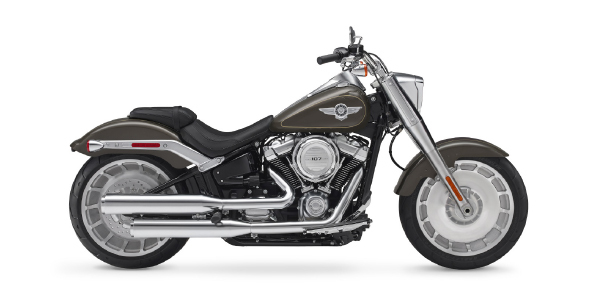 “With high-performance dual-bending valve front suspension and an easily adjustable hidden rear mono-shock, the aggressively styled 2018 Softail models are faster, lighter and better handling than any of their Big Twin cruiser predecessors,” according to Harley. “The 2018 Harley-Davidson Softail Makes Once-Great Dyna Irrelevant,” proclaimed the headlines in Hot Bike magazine, one of the media outlets to get a chance to ride the new machines even before the dealers saw them. This shocking pronouncement comes courtesy of the new shock set up. What’s new? All eight of the new bikes share a number of upgrades, including: Daymaker Signature LED Headlamps, improved electrical system charging (more than doubled at idle), easily adjustable rear shock pre-load settings, steering-head-mounted USB charge port, new instrumentation, keyless ignition, security system standard and new fuel tanks. Unique to the Fat Boy is the modern-day interpretation of the classic headlight nacelle. It also gets a rear tire mounted up front: the 160mm front is the widest front tire ever found on a production model Harley. ABS also comes standard, and Lakester wheels in a package that is 31 lbs. lighter than the 2017 version. Vintage ’50s styling with modern technology. Highlights include detachable windscreen; rigid saddlebags, cruise control and ABS. The “taller” suspension offers increased passenger and cargo payload capacity. Like the Fat Boy, the Heritage Classic also went on a diet, shaving 32 lbs. off the total weight. Harley says the Low Rider was inspired by the individualism of the ’70s custom chopper era. The throwback-style dual tank-mount speedo and tach gauges, headlight visor and fuel tank graphics all pay tribute to the ’70s. It gets 19-inch front and 16-inch rear Radiate cast wheels and 2-into-2 Shotgun exhaust. The Softail Slim pays homage to post-war bobbers with a narrow rear end, trimmed front fender, solo seat and minimal chrome. Laced wheels, tuck-and-roll seat, front nacelle and fork covers are other styling cues for the Slim… which also trimmed 35 lbs. off the previous model. The Deluxe gets LED lighting, Tombstone taillight and blade turn signals. Pull-back bars and ABS brakes. What it doesn’t get is 33 lbs. of suet from the previous hog. Harley bills the Breakout as “dragster attitude and style” – the smooth-top 3.5-gallon fuel tank and raked out 49mm forks accentuate this perception. The18-inch rear and 21-inch front tires are mounted on powder coated cast aluminum wheels. It also gets ABS brakes and a 35 lb. weight reduction. Blacked-out take-no-prisoners looks help the Fat Bob stand out… so do the massive meats (150mm front and 180mm rear). Dual disc brakes, 2-1-2 upswept performance pipes, inverted 43mm cartridge forks and a 3.6-gallon fuel tank are the hallmarks. Fat Bob lost 33 lbs. of “fat” compared to last year. 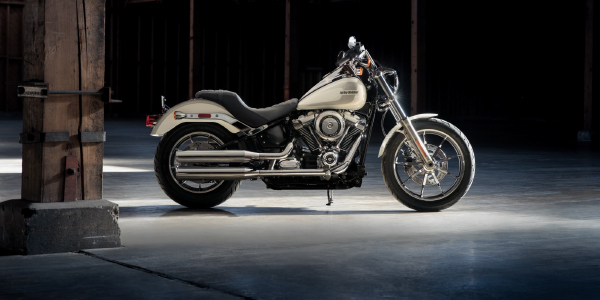 The bare-bones Street Bob has the lowest MSRP in the new Softail lineup. Styling cues include a smooth-top 3.5-gallon fuel tank, black spoke wheels with chopped fenders. It also features a 17 lb. weight reduction. There is a supply of clean low-mileage Harley inventory competing with new bike sales. Dealers need to embrace the pre-owned sector as well as what’s new. That being said, the decision to do away with the V-Rod seemed a forgone conclusion. However the jury is still out for the other changes for 2018. Will the demise of the old Dyna result in the rise in retail sales? The magazine pundits seem to think so, but dealers will have to wait to see what their customers have to say. The demise of the Dyna came with plenty of online controversy, the V-Rod, not so much. While the keyboard warriors are all up in arms, the editors who have actually ridden the new Harley’s have have been universally positive. “2018 Harley-Davidson Softail Makes Once-Great Dyna Irrelevant,” proclaimed Hot Bike magazine. 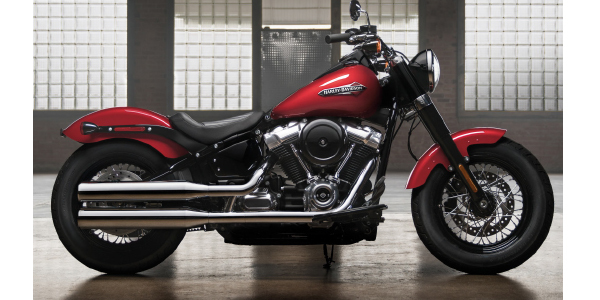 “All-new Fat Bob is the best-handling cruiser that The Motor Company has ever built! The Dyna Faithful, the Dyna-razzi, or whatever you want to call them will moan, “Oh, man, they killed the Dyna!” Well, not exactly. The new Softails kill the Dynas they succeed. They are that good,” said Hot Bike’s Ed Subias “All of the new models are head and shoulders above their previous year models,” noted American Iron’s Steve Lita “Some more than others. The editors were more charitable… and certainly more articulate than some the stuff we have seen spewed on the Internet. Change is inevitable, let’s hope the timing is right.